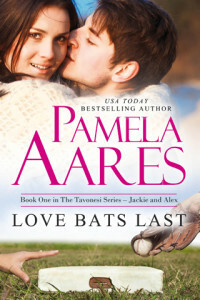 Love Bats Last is the first in Pamela Aares’s series about the Tavonesi family. Just like so many other romances, the series follows an extensive tribe of people. This one is about Alex and Jackie and might be my favorite of the whole series. Alexi Tavonesi is a star pitcher but also runs his family’s vineyard in the Napa valley. Professionally, he’s on top of his game – nearly there on pitching a perfect game and the vintages at the vineyard are starting to really come along. If he could just get a girlfriend to get his family off his back, then everything would be perfect. The normal bat bunnies who circle players are simply not Alex’s cup of tea any longer. Poor lad, you know? Jackie Brandon is a world renown marine biologist whose life and work center around seal rescue on the Northern California coast. She’s pulling a bit of a hiding act out there, though, hiding from her aristocratic English heritage and a soccer star who broke her heart. Jackie devotes all her time to rescuing sea mammals and is fearless in her protection of them. A chance storm brings the two together and they each get drawn further and further into each other’s worlds. Jackie has to learn to trust this athlete and that just because one douchecanoe who got paid to play was in her life, they’re not all the same. While their romance blossoms, Jackie discovers that someone is intentionally harming the seals and the two set out to put the culprits in jail. This book is a delight – a sweet story with a compelling love story and a good mystery at its heart. I ran across this book as part of a sports bundle sold on Amazon a few years back and immediately went on to read the rest of the series. I just hit pre-order on the most recent one – Aares has entranced me with this world and I can’t wait to read more. The baseball is well written and I liked the complete treatment of the culture. Baseball, to me, must always be enjoyed with a good beer. Coke is clearly an acceptable option for the teetotalers among us, but I am – as you well know – not anything close to a teetotaler. My go-to baseball beer is Yuengling and if you’re not familiar with America’s oldest brewery, I’d give it a run. Marine Mammal Center: I’d imagine that if Jackie were a living human, this is where she’d work, or she would certainly support their work. If this book peaked your interest, check out the MMC. Napa Valley Wine Train: If reading Alex talk about his wine made you thirsty, check out this unique tourist experience in the Napa Valley. I bought this book as a romance eBook bundle on Amazon. Sadly, that bundle seems to no longer exist or I would link to it! Animals, Baseball, Beer, Contemporary, Romance, Rose Wine, Series, Suspense, U.S.